Dinosaurs of all shapes and sizes gather in the latest edition of a much-loved energetic book. Jurassic-fans everywhere will enjoy this timeless and exciting prehistoric romp. 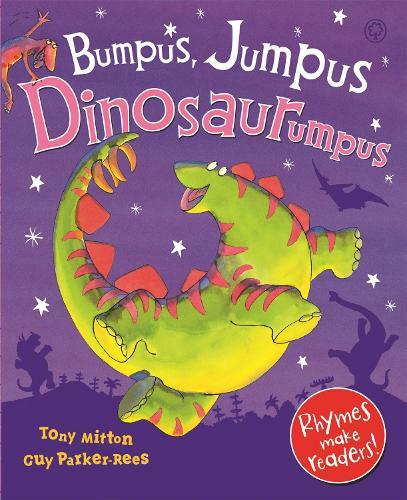 Join in with Triceratops, Stegosaurus and their friends as the dinosaurs stir up a dinosaurumpus! But what's this? Terrifying Tyrannosaurus is about to gatecrash the party. Will he eat them all? With its read-aloud rhyming text and exuberant illustrations, this is a sure-fire winner from the popular duo, Tony Mitton and Guy Parker-Rees, illustrator of the bestselling Giraffes Can't Dance - for pure clap-along, dance-along fun.